In Europe, decreases are passing on late August deals for PVC after many players returned to the market following the summer holidays. Declining upstream costs caused some players to expect the current downward trend to extend into September, according to ChemOrbis. A West European PVC producer is giving August offers with decreases of €15-25/ton both in the contract and spot markets. A producer source commented, “We might concede to further reductions, but we will try to limit our discounts to €30/ton as we are seeking to recover our margins following a prolonged force majeure. The Italian market is still very calm. 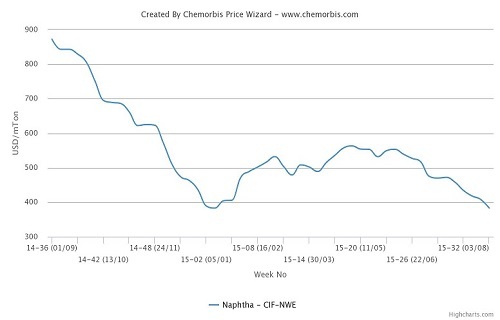 Regarding September, we expect to see additional decreases considering the sharp losses in crude oil and naphtha prices.” Indeed, spot naphtha prices on a CIF NWE basis broke below the $400/ton threshold at the end of last week. Pulled down by the weakness in crude oil and naphtha prices, spot ethylene prices also declined by around €80-85/ton week over week due to improved cracker rates, especially at Shell’s Netherlands cracker in addition to the shutdowns in downstream output. An agent of another West European producer sold out his August PVC allocation with decreases of €35/ton in Italy in line with half of the monthly ethylene drop. The seller expects to see a new round of price cuts in September. Another distributor in Italy also sold some Central European PVC down €35/ton from July. “The market is still very quiet due to the summer lull. Our supplier declared force majeure after experiencing a problem related to upstream output. Therefore, they might face some supply issues in the days ahead. Buyers are taking a waiting stance in anticipation of further decreases in September,” he commented.